I just love using household items in my garden in a creative way. 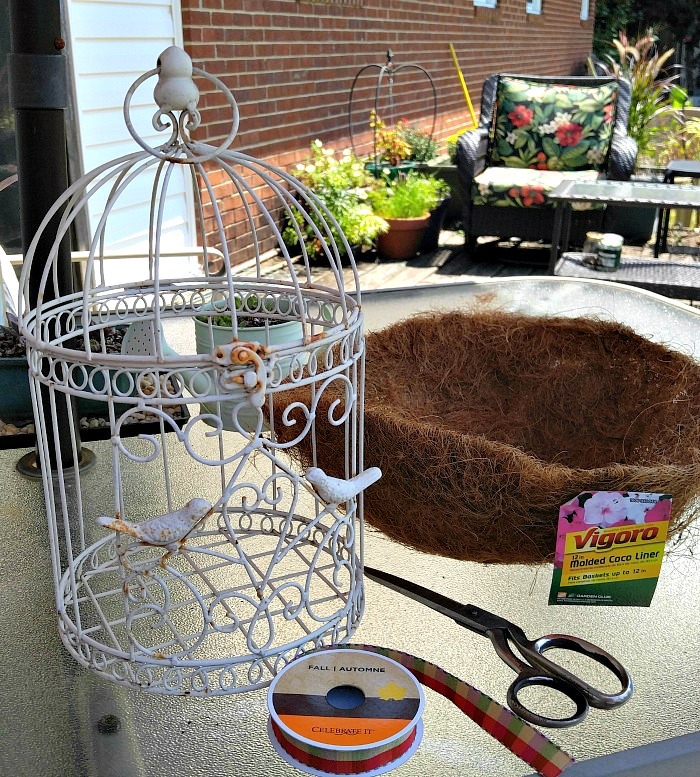 Today’s project is going to be to transform an old birdcage into a succulent birdcage planter. Succulents require very little maintenance and this makes them the perfect choice for this type of project. You can place the birdcage on an occasional table, hang it from the eave of your home, or place it in a sunny spot in your kitchen. Succulents are some of the easiest plants out there to grow. They root easily, need very little water and can take a lot of heat and sunlight. I have these beauties all around in my garden. Some are in planters, and many of the hardy succulents are planted in my Southwest garden border, right in the ground and also in my cement blocks planter. I love to use succulent plants that I have rooted from their leaves in junk gardening projects. Check out this wooden drawer planter that looks as though it was designed especially for the plants. Do you have an old (or new!) birdcage hanging around? This cute and easy project is one that you will love to do and it could not be simpler to put together in just a few hours. 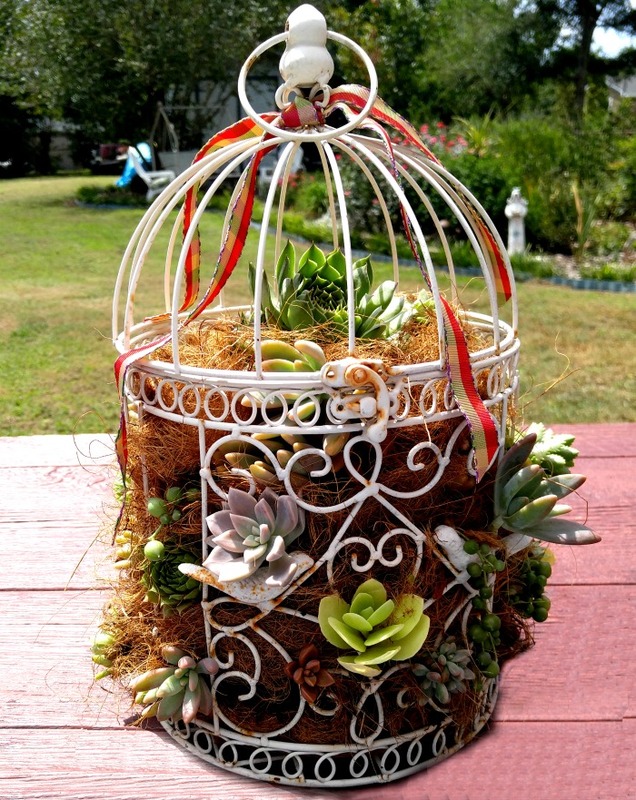 This succulent birdcage planter can be done in a few hours, but has huge impact on my patio. 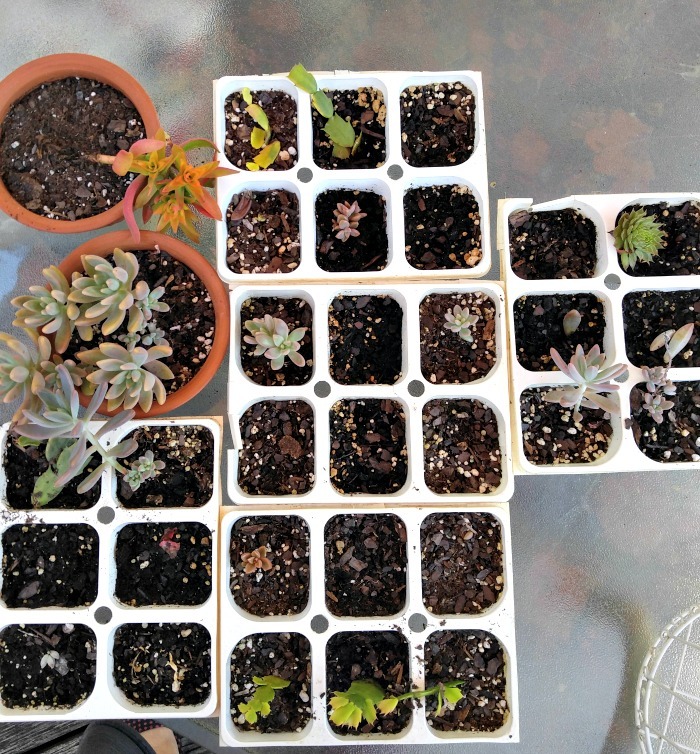 I was fortunate enough to have several trays of succulent leaf cuttings from a project that I did a few months ago, and also had some succulents growing in pots that had extra “babies” growing, so I had a good supply of a variety of types for my project. 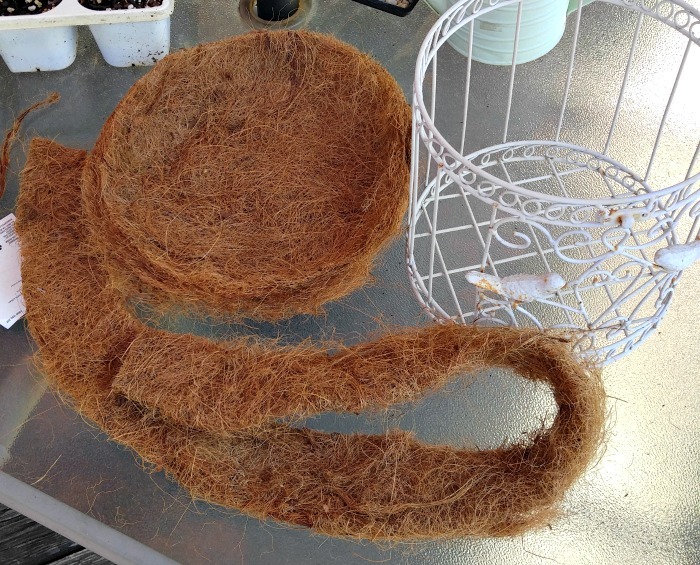 I started by cutting my Coco fiber basket liner to a size that would fit well in the bottom of my birdcage. I kept the extra fiber to use as “fillers” for the spaces between the layers of plants and also as liners for the edges of the layers to keep the soil in place.. I used a fork to prick out my leaf cuttings. I wanted the roots, but not too much soil, since I will be using so many plants in my project. The fork protects the roots from damage and gets just a small amount of soil with the plant. 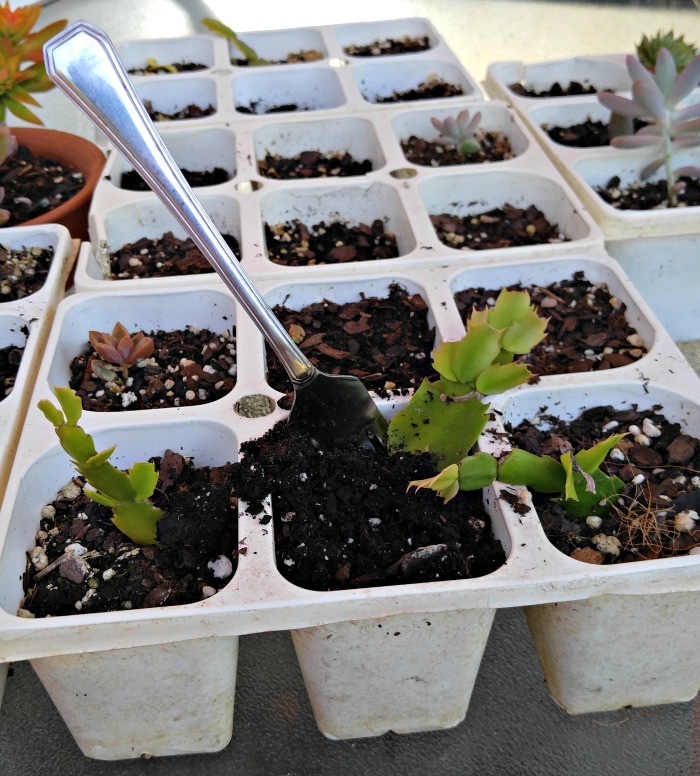 Start by placing the succulents on their SIDES on the first layer of soil. 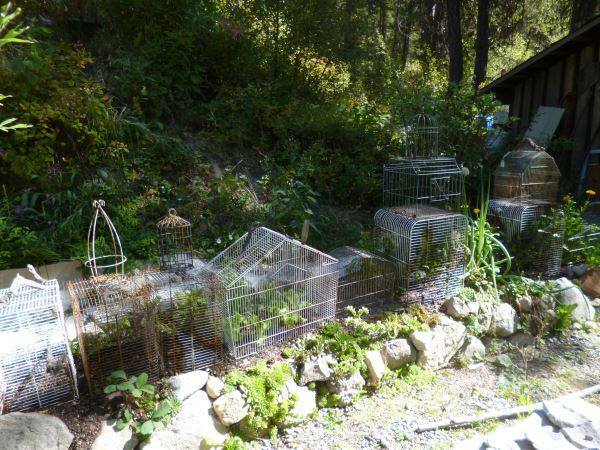 Since they will be growing to the outside of the birdcage, you won’t plant them upright by on their sides. Go around the birdcage, bringing the heads of the succulents outside the bars of the birdcage. Once you have the first layer done, add some of the extra fiber to make edges for the next layer and add some more soil and another layer of plants. 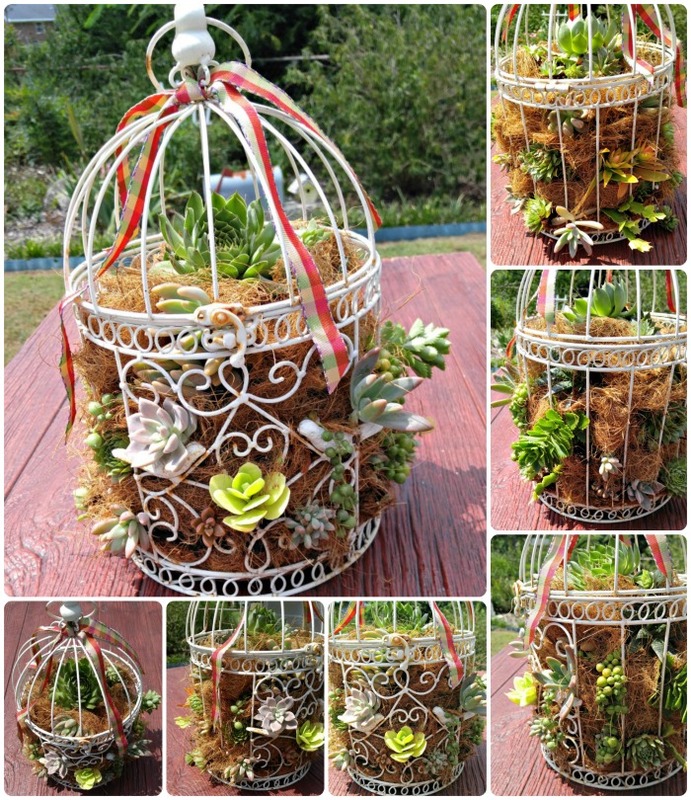 I alternated between large and small, compact and hanging plants to give interest and dimension to the succulent birdcage planter. Continue adding plants, fiber edging, and soil until you get to the top area. I place a large hens and chicks on the top layer. It will send out some babies, in time, and fill in the top. Two lengths of the plaid ribbon got attached at the top for a decorative touch. When you finish, you will notice that there are areas on the side of the planter where the soil shows. To fill these, just pull pieces of the Coco fiber and stuff it into the areas that need covering. I tucked the fiber behind the bars of the birdcage and it stays in place well. 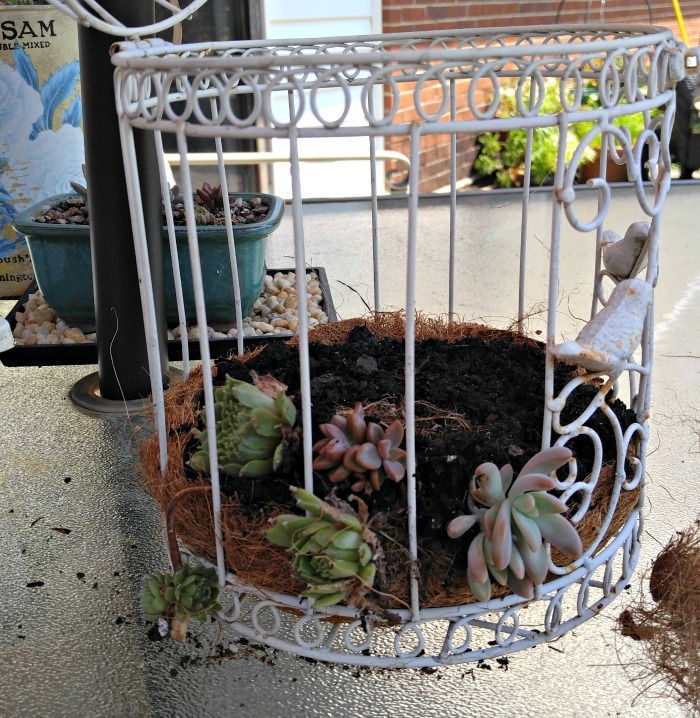 The finished succulent birdcage planter is such a creative addition to my patio. 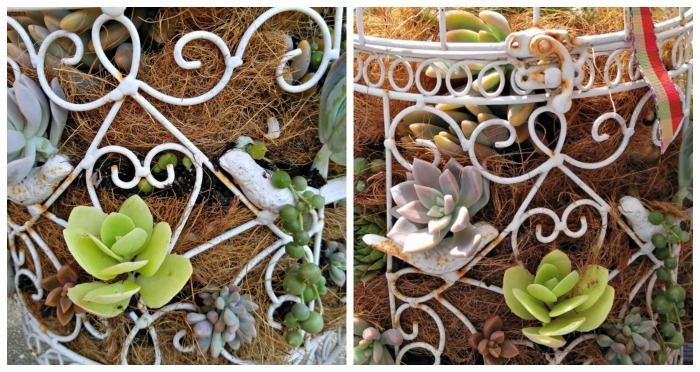 I love the combination of rosette types of succulents and hanging style. The planter is so versatile. Here I have it sitting on a patio coffee table. I can just water it with my hose so easily and move it to the edge of the table to drain. It makes a lovely decorative touch. It is equally at home hanging from the eaves outside my patio doors. When I have it up here, I can use a watering wand to give it the moisture it needs. This was such a fun and easy project to do. I made a big mess of my working area with all the loose soil until I got all the fiber in place, but it stays together beautifully now. I can’t wait to see how it looks in a few months when some of the hanging succulents start to grow, and the smaller leaf cuttings grow into bigger plants. Don’t you just love all the varieties of succulents in it? I will have to bring this indoors for the winter, since most of these plants are tender succulents, and the freezing weather would kill the plants, but It will be right at home in a sunny window until next spring.. 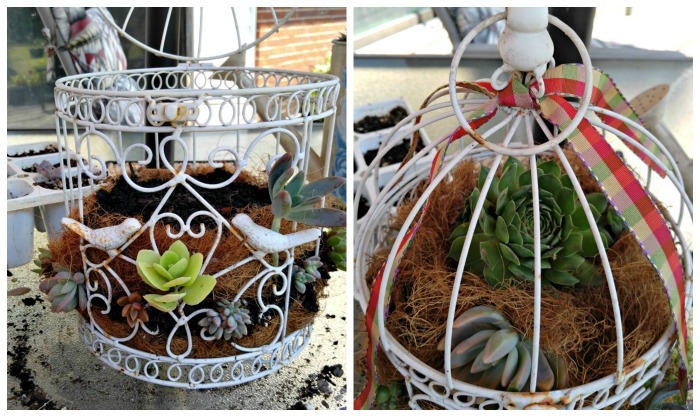 So dig out your unused birdcage and turn it into a creative succulent birdcage planter. You will love the way it looks as well as the minimal care that it needs. I’d love to see what you do with your birdcage. Please feel free to send me a photo of yours, too!. I’ve been collecting those for a few years now. Some are actual bird cages, so I remove the bottom tray and use that for something else, and some are the reproduction type, like yours. Either way, they make great plant protection to keep the deer away. I love that idea! I’ve got a few that are pretty big, unfortunately, those are not the fancy type. I’ve started stacking them up with a pretty one on top of a plain one, which works. You could even wire it on. What a lovely planter! 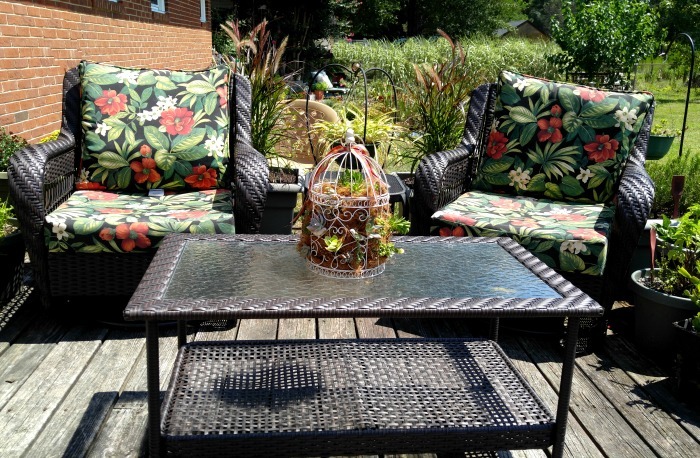 It looks just gorgeous on your patio table! Thanks Jess. This is one of my favorite projects! 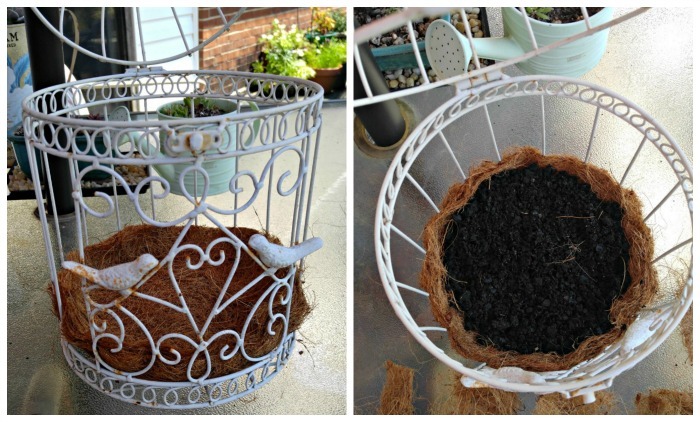 You have made a wonder birdcage planter. Do you have a YouTube channel as well? 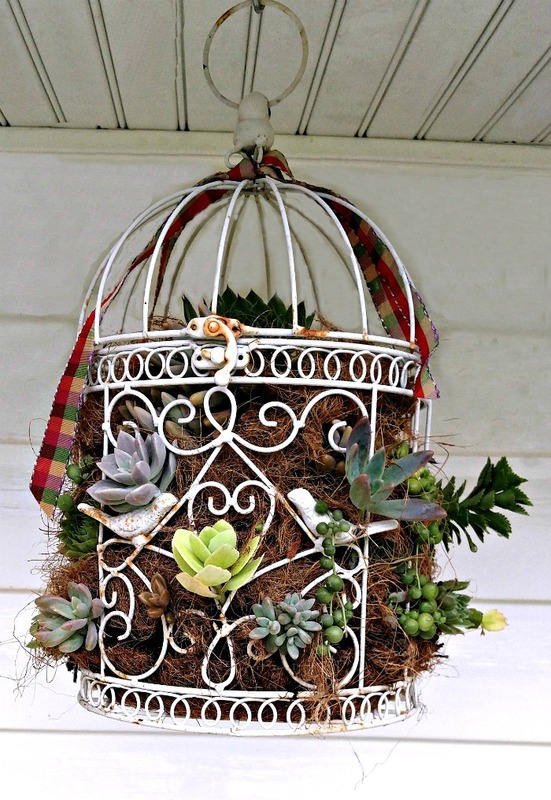 I want to see the complete process in the video if you have a video tutorial for this birdcage planter. Hi Sophia. I don’t do live videos but thank you for your interest.